Avowal is a time-based sculptural installation which incorporates metaphorical materials examining the dreamlike state, or nightmare, of an ending relationship. Wishing to declare the truth, or the existence of obsession in ending intimacy, I draw unclear lines between phrases by screenprinting text hazily on a wall. The phrase reads "thinking of you are you thinking of me thinking of you" over and over becoming unclear which part of the phrase comes first. In front of the towering wall sits a bed, filled with soil and grass seed. Two concrete pillows lay haphazardly over top one another in the middle. 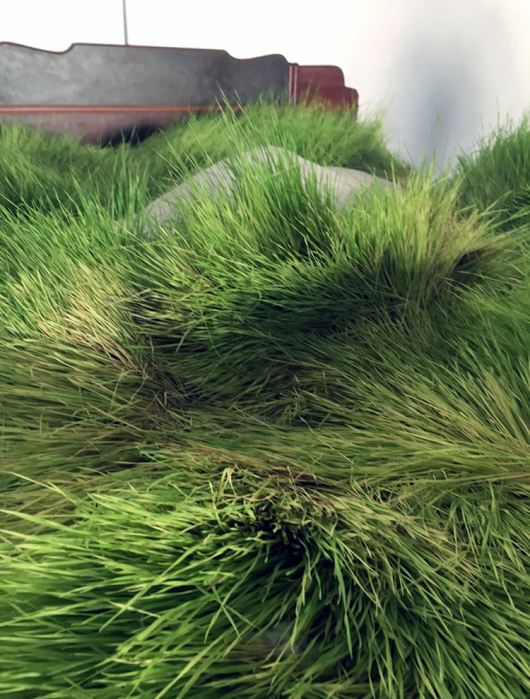 The grass grows, it surrounds the pillow. It starts lush and young, it becomes overgrown, it begins to yellow and shrivel. The pillows become shrouded within the withering blades. The grass references the lifespan of ending relationships. The piece references a scarce bedroom, a sacred and shared space which often holds the weight of relationships.